Available in black. Brown NOT available. if you order this wallet ID #1175, you are ordering black. This cute little leather coin wallet is made in Morocco from 100% leather and stamped with golden motifs. 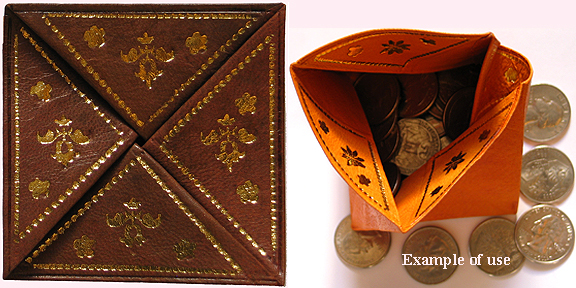 As shown on the image to the right, this leather wallet could be used to hold coins. It is ideal to have in the car to hold quarters for parking or to give as a little cute gift. Just opening and closing this wallet like a little puzzle is fun!